With less than four weeks to go until Election Day, campaigning in the city is heating up around Proposition C, the “Our City, Our Home” initiative aimed at taxing corporate revenues to pay for services for the homeless. If passed, Prop C would impose an average of a half-percent in gross receipts tax on corporate revenues of over $50 million. The tax revenues, which would amount to $300 million per year, would be used to create 4,000 affordable homes for the lowest-income San Franciscans, more than the city has built in 30 years. There are only five San Francisco propositions on the November ballot, but they could have lasting effects on city policy. 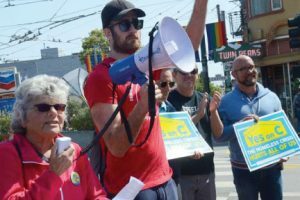 Seeking to galvanize support for Proposition C, which would raise taxes on big corporations in San Francisco to fund homeless services and supportive housing, about 100 people rallied and knocked on doors in the Castro last weekend. If passed, Prop C will levy a half percent in gross receipts tax on corporate revenues over $50 million. 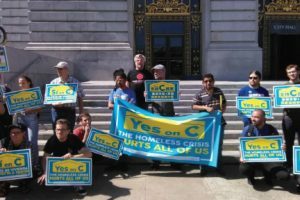 According to supporters, if passed, Prop C will generate $300 million per year to help tackle the housing affordability and homelessness crisis. 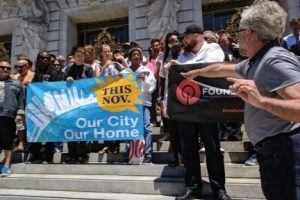 The money would, supporters say, create 4,000 affordable homes for low-income San Franciscans, fund 1,000 new shelter beds to move people off the street and indoors, fund mental health and substance abuse treatment, and add more public restrooms, jobs for people to help keep the city clean, and create thousands of rent subsidies to help people stay in their homes. Hollie Beck is a 77-year-old transgender veteran. She served in the Navy from the mid-1950s to early 1960s, where in a past life as a male, she was stationed aboard a ship, based in San Diego. 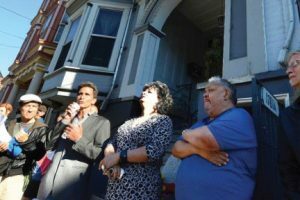 A spirited protest was held Monday night in front of the home where four LGBT tenants and a straight woman are fighting an Ellis Act eviction. 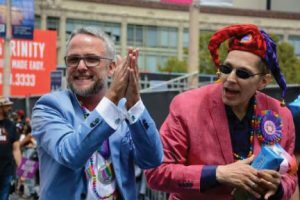 Well known figures, including gay former state lawmaker Mark Leno and gay District 8 Supervisor Rafael Mandelman, called for the repeal of the Ellis Act at the August 6 gathering at 1781 15th Street that included about 75 people. 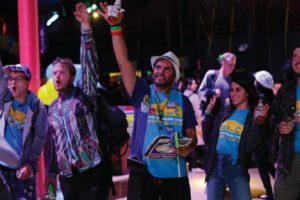 Supporters of a campaign seeking solutions to San Francisco’s homelessness problem celebrated Monday, after learning that they collected more than twice the number of signatures needed to place a measure on the November ballot. 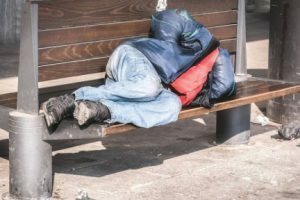 Advocates for a new initiative to fund homelessness solutions by taxing big business submitted thousands of signatures to put the measure on the November ballot at San Francisco City Hall Monday.